If you want to see two girls with phenomenal harmonies and spectacular leads, don't miss Venyx. The founding members and lead vocalists, Jessica Stewart and Cynthia Lugo, along with Les Brooke on bass and keys, Leon Wilde on guitar and bass, Luke Landis on guitar and bass, and Dan McCoy on drums, guarantee not to disappoint! So, I take it they're a cover band, eh? Yep. If you like to dance, come check us out. Amazing voices and great musicanship. Definitely not my thing, but those girls do have some serious pipes. And def. hot. You guys certainly rock better than some other chick-fronted cover bands in this town. You should have no problem getting gigs. Many talented singers and musicians are not composers, nor do they have the desire to be one. For many, their gift is in the interpretation and performance of the music of others. You've very clearly stated your opinion, and your previous posts indicate that you're a strong supporter of local original music. THERE IS CERTAINLY NOTHING WRONG WITH THAT! 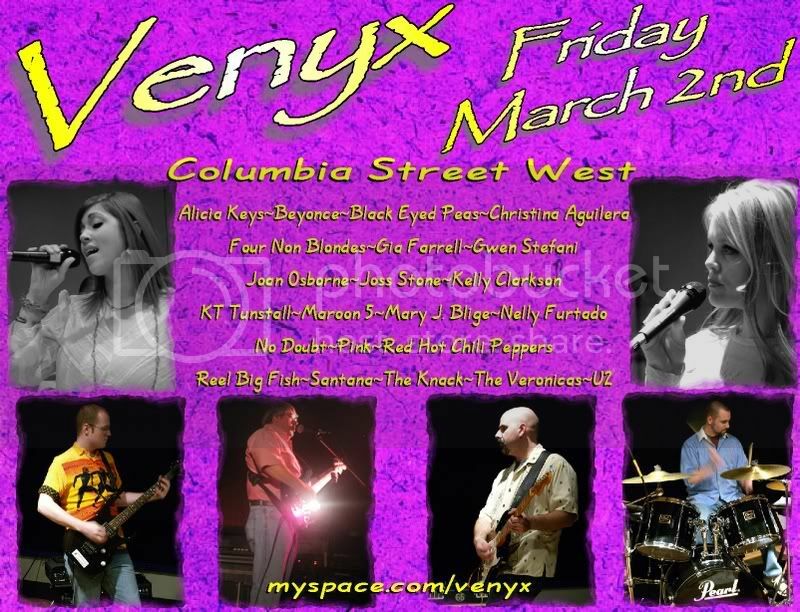 Of all the local original acts you support, how many would be truly qualified to write and arrange music for a group like Venyx? I've been out to see almost forty different local acts in the last six weeks. I have listened to a veritable plethora of local original music clips at FWM, Myspace, and other websites. With all due respect to those local composers and arrangers, it would appear to be a very short list who could, or would, write and arrange music for Venyx. All that being said, maybe Venyx has no interest in performing original material. On the other hand, maybe they do. THERE IS CERTAINLY NOTHING WRONG WITH THAT EITHER! I say support what you want, but I will never agree with your notion of "Hating it when looks AND talent are wasted on cover songs." Maybe playing other people's songs real well and getting booked instead of struggling to write a bunch of artless, self-absorbed and obviously derivative crap that nobody wants to pay to hear IS their own thing. ...and they play *real* instruments, too. For many, their gift is in the interpretation and performance of the music of others. Word that. I'm learning three songs right now from one of my new favorite bands, The Avett Brothers, and let me tell you, it's a blast. I think what Jewlee is really driving at is two things: be creative and original; and DON'T cover Kelly Clarkson. haha..Kelly Clarkson. To be honest, when I joined this band, I didn't really like MUCH of what they did, but the musicianship and talent made it impossible to pass up. Now I actually listen to 96.3 and 107.9 to hear what's new and what new songs would sound good with us doing them. When I listen to this stuff now, I'm amazed at how empty some songs are, and how full others are (what with all the sequencing, etc. ), but would be wicked if we could pull them off. We have, on everything we're playing out (including Kelly!) And trust me...with Jess and Cyndi singing, you don't hear Kelly, you hear Jess and Cyndi! As far as the being original thing goes...with what we are doing, we have to be original. Let me explain. With a song that has just drums and a sequenced keyboard part, how do you arrange that for a 6 piece band with guitars, bass, keys, and drums? Some of what we do is like that. There is, as well, the stuff that we do as close to the original as possible. People don't want to hear Beyonce done your own way. They want to hear what they know. The originality comes in making a song sound like everyone knows it to sound, and still making it our own arrangement. I've done the original thing for YEARS. I love playing original music that I had a hand in writing. You know what I like even better....playing for more than 10 people...playing for people that really want to hear what you're doing...getting paid more than pennies a gig...getting gigs! Shoot me for quoting that. But it's true. Don't like cover bands? Don't support them. And don't tell others what they should do when in actuality, it's what YOU would do if you had the talent to do what they do. Because see, here's a little secret...some people DO like cover bands! Last edited by Dagwood Lee on Wed Feb 21, 2007 1:58 pm, edited 1 time in total. Anyway, come to Dicky's on St. Paddy's Day and stay a little longer than last time and you'll know what I mean. My wife had to get up stupid early the next day...sorry! As far as getting paid pennies and playing what you love..I've done that. Jeff Lipman and the Informers is a perfect example. We played lots of gigs for not a lot of moolah, or people. And don't get me wrong about what I'm doing with Venyx. I love it! I would have never thought I'd play in a band covering Christina Aguilera, but DAMN is it fun!! i come from a metal musical background, and have also found playing Christina Aguilera to be pretty fun. and that's what i have in Venyx; fun. and that's what we want for our audience. fun. No Man Can Eat 50 eggs!